When it comes to the holidays, big towns and small across the United States celebrate with their own unique twist. From the classic events with bundled up crowds in major cities, to the lesser-known festivals in tropical paradises, take your pick! Either way, these holiday celebrations are guaranteed to thaw out the cold and warm your heart this season. These are 15 of the very best. Also known as the Tournament of Roses, this event attracts thousands upon thousands of people every yea to Pasadena, California. This is the ultimate New Year’s Day celebration. The parade features floats adorned with beautiful flowers, marching bands and much more. The event is followed by the highly anticipated Rose Bowl college football game, which has been a staple of American culture since it began in 1902. Every December, the National Christmas Tree in Washington D.C. is illuminated during a public ceremony and the White House transforms into a winter wonderland. Decorated with evergreen wreaths and several Christmas trees, each tree is trimmed with handmade ornaments created by artisans from every region of the United States. Visitors can get up close and personal to the White House and tour the spectacularly-decorated public rooms. If you can’t make it to Washington D.C., you can also view the holiday festivities via webcam. Small paper lanterns, or luminarias, are a common tradition in the Hispanic and the American Southwest communities during the holiday season. Old Town Plaza in Albuquerque, New Mexico is perhaps the most famous for its Luminaria Tour, which features thousands of these paper lanterns lining the plaza walkways. You can also spot luminarias lining the driveways and rooftops of entire neighborhoods in this part of the country during the month of December. This annual festival of lights takes place on the island of Kauai, Hawaii and combines the island’s rich history with the joys of the holiday season. The festival started with Auntie Josie Chancy, a folk artist born and raised on Kauai, that began crafting beautiful decorations and ornaments from whatever she had at hand to adorn the inside and outside of her home. Her home is now known as “The Christmas House” and hundreds celebrate with a visit and Festival of Lights parade. Any time of the year is a great time to visit Disney World, but the park goes all out for the holiday season with an impressive lineup of special events, parties, and out of this world decorations. All four theme parks and Disney Springs deck the halls with spectaculars, holiday treats, and exclusive events, making a visit to this magical land a special tradition for many families across the country. Portland residents and visitors won’t want to miss one of the biggest and most exciting Christmas celebrations in the country: The Magic of Christmas. Featuring the Portland Symphony Orchestra, and accompanied by aerial artists from the Cirque de la Symphonie, this is a breathtaking event that will capture your heart this holiday. Boston Common is the country’s oldest public park, so there is no wonder they know how to celebrate Hanukkah in a heartwarming and authentic manner. People gather around the 15-foot menorah for nightly lightings. The tradition, starting in 1983, attracts an incredibly diverse crowd every year. As one of the most important traditional Chinese holidays, there are also numerous New Chinese Year celebrations across the United States. During Chinese New Year, friends and family spend time together to enjoy a very large dinner and to celebrate. One of the most famous celebrations is the Chinese New Year’s Day Parade in San Francisco, California, which has been named one of the world’s top 10 parades. Gorgeous floats, elaborate costumes, and fireworks are just a few highlights of the parade. This is one of the biggest Kwanzaa celebrations in the country. Every year in Richmond, Virginia, people gather to not only observe the holiday, but to celebrate with musical performances from African dancers and singers, activities for children, and delicious African food. The annual production of George Balanchine’s “The Nutcracker” is one of the most popular performances during the holiday seasons. Every year, hundreds make it a family tradition to experience the breathtaking costumes, sets, and dancing. The enormous Christmas tree that grows from a height of 12 feet to 40 feet is an audience favorite. This winter event, held on New Year’s Day, brings over 10,000 courageous participants to plunge into the freezing Chesapeake Bay. The polar plunge is held to raise money for a charitable organization, and usually raises money for athletes around Maryland. 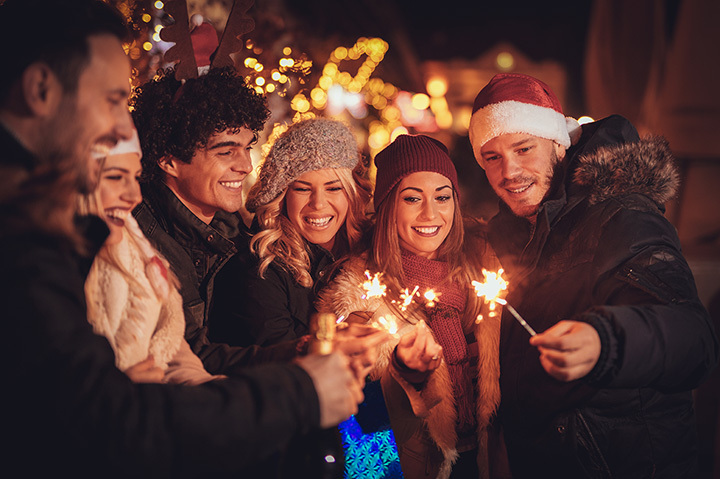 One of the world’s most beautiful theme parks in Williamsburg, Virginia comes to life during the holidays with its Christmas Town celebration. Festivities, holiday shopping, and thrilling rides bring the magic of the holidays to the masses. It doesn’t get much more picturesque than the sight of the Rockefeller Center Christmas Tree in New York City during the holiday season. The stately tree towers above the famous ice rink and glistens with thousands of lights. The lightening of the famous tree draws thousands of visitors every year to “ooh” and “ahh” and celebrate with a star-studded line-up of entertainment. The National Gingerbread House Competition, held annually at the Omni Grove Park Inn in Asheville, North Carolina, has grown into one of the nation’s most celebrated and competitive holiday events. It has merited nationwide broadcast coverage for its stunning creations on display at the event. Hundreds of visitors stop in every year to get a close-up look at the amazingly detailed gingerbread houses displayed in the hotel. People across the country celebrate New Year’s Eve with a variety of events from parties with family and friends to concerts and firework displays outside. Festivities vary city to city, but each region has its own traditions for the special day. One city that rocks New Year’s Eve like no other is New York City. In a tradition dating back to 1907, New Yorkers famously gather in Times Square to countdown to midnight. Millions across the country also watch the televised event and celebrate as if they were right there celebrating too.